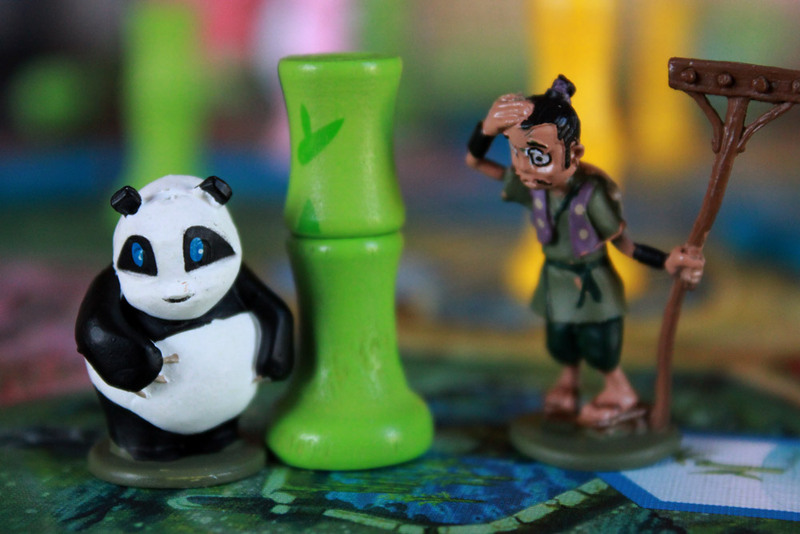 When is the last time you played a board game about a panda? What? Never? That’s probably because there haven’t really been any. Sure some zoo or animal-themed games contain pandas, but nothing has centered around the victual-pursuing antics of a giant fat panda. Fortunately, Takenoko is here to fill that gap. 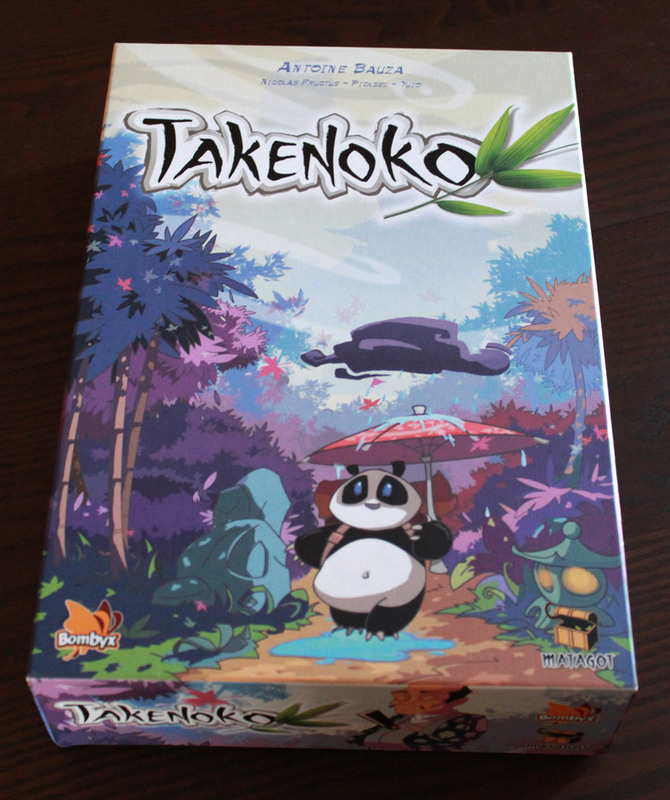 Takenoko recently took home the French As D’Or 2012 top pick award. That’s basically France’s game of the year award, so good job Takenoko. I actually haven’t heard a huge amount of buzz about this game, so I wont ask if it lives up to the hype. But is it worth a look? Takenoko is pretty simple. Each turn players roll the Weather die, gaining a small bonus depending on the roll, and then take 2 of 5 possible actions. The weather die has 5 effects and a Wild side, which allows you to pick the effect of your choice. Rain grows Bamboo in one spot. Lightning scares the Panda, allowing you to move him to any garden space – this also results in said panda eating some Bamboo. Sun allows you to take a 3rd action, and Wind lets you make both of your actions be the same (normally your choice of 2 actions must be different from each other). Finally, the Cloud lets you take a special token, which you can later add to a garden hex to give it a special trait, such as growing bamboo faster or protecting a particular hex from the Panda. The 5 actions are as follows: you can place a new garden hex (important, since the garden starts out as only a central “pool,” take an irrigation token (used to water plots of the garden that are not adjacent to the center pool; otherwise they can’t grow bamboo), move the gardener (who grows Bamboo), move the Panda (who eats Bamboo), or take a new card. The cards have specific conditions on them that, if met, give you points. Conditions range from growing certain colors of bamboo to certain lengths, having your panda eat a certain arrangement of bamboo colors, or arranging the garden tiles in a specific manner. The game ends when one person completes a certain number of these cards, allowing each other player one last turn. EDIT: Note: There was an error discovered in the rulebook regarding the drawing of Garden tiles – the rulebook states that a player draws 3 tiles and returns 2 to the top of the stack. The correct rule should read that the player should discard the 2 to the bottom of the stack. At the time of this note (November 2012), there was no FAQ clarifying this on Asmodee’s website, but this was learned from the designer himself. Takenoko is an easy game to learn, but it’s also very interesting. The real hook here is that none of the players own their own garden, or even own any part of the garden in particular. Your actions each turn influence the state of the garden for everyone, and the actions of other players affect the state of the garden for you. Instead of trying to build a better garden faster, or destroy the other players’ gardens, you have to carefully arrange things to earn your own points without helping the other players. Unfortunately, since you don’t know what cards they have, you will probably end up inadvertently helping them anyway. 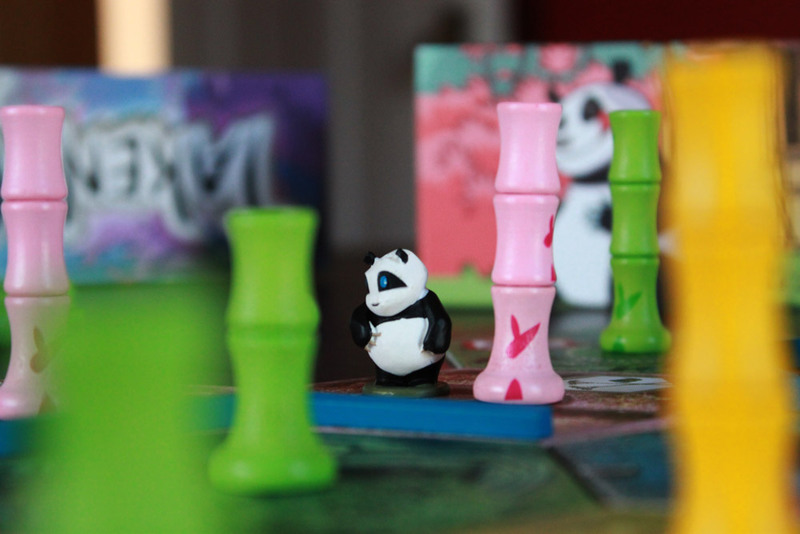 Takenoko is bright and colorful, with adorable prepainted minis for the panda and the gardener, nice wooden tokens that stack up for the bamboo, and solid art on the game hexes. 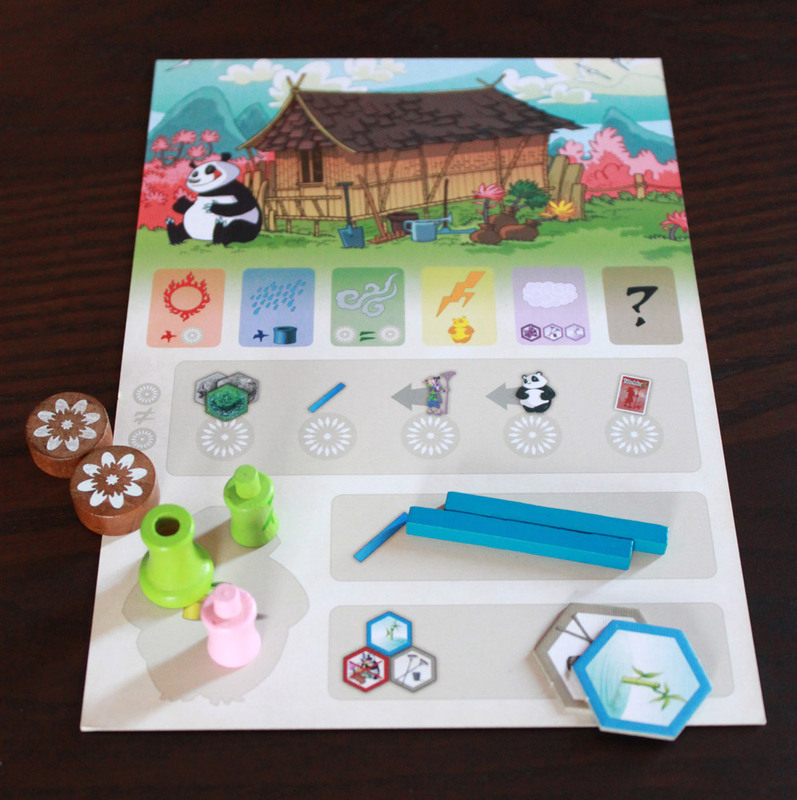 Player sheets are not only helpful—with iconic representations of the weather die results and possible actions—but also functional, with areas to store irrigation tokens, segments of bamboo eaten by the panda, and even two wooden markers to mark which actions you’ve chosen for your turn. This is a gardening game, and as such, it’s part of the fun to watch the whole thing grow from start to finish. You begin with only a single blue hex with no bamboo. By the end, you have quite a large, colorful garden with enormous stalks of bamboo with a very fat Panda doing his best to munch it away and a very frantic gardener doing his best to keep the garden growing. 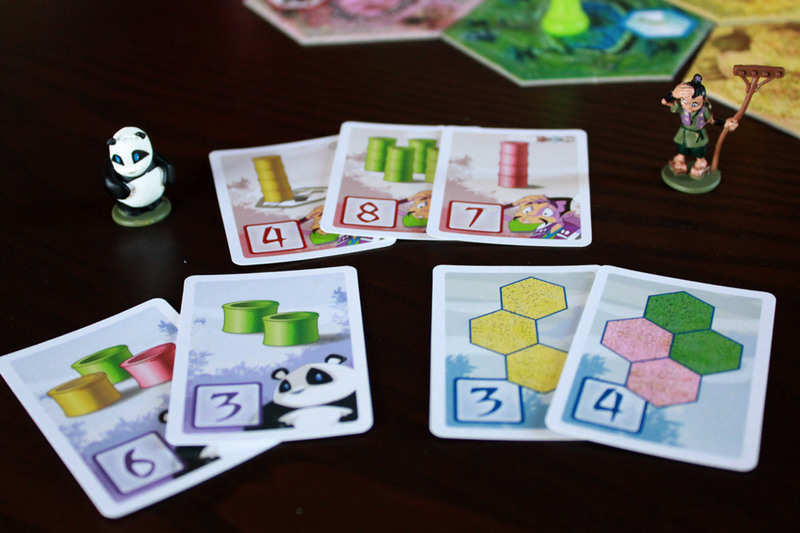 In my first few plays of this game, I missed a rule about the gardener, which resulted in a very small amount of bamboo being grown—it was too easy for the panda to keep up. This resulted in a rather disappointing experience—there was little strategy to be had, and you just had to hope the other player wasn’t going to eat what you were trying to grow. After the rule was discovered, it made the experience a whole lot deeper on top of allowing the garden to grow and flourish, resulting in something more spectacular at the end. And despite the simple choices available, there is depth and strategy. You’ll be struggling to arrange the garden to grow bamboo efficiently on the spaces you want it to grow; you’ll be frantically moving the panda to keep bamboo in check (and keep his stomach filled); you’ll utilize every bonus from the weather die to meet your needs. There’s a bit of tension as you see a great move and hope that none of the other players ruin it before it’s your turn again. In some sense, Takenoko feels to me a bit like the next step up in complexity from Ticket to Ride. It’s still a very straightforward turn; you choose from a set of very simple actions, which keeps the game moving, while trying to satisfy conditions on point cards you can obtain throughout the game. However, you get two actions and a weather bonus, so you do have to think a little bit more about your options—and there’s a lot more direct interaction with what the players do. Takenoko is a lot of fun, although there’s not a huge replayability factor. Sure, the garden is different every time, but nothing alters the gameplay or the basic strategies. But not every game needs to be Dominion, and that’s okay. Takenoko accomplishes what it sets out to be—a friendly family game with interaction and direct competition without a lot of spite. It’s colorful and easy on the eyes, and the tokens are a lot of fun to play with. (Unfortunately, fancy bits and beautiful art do not always make a game long-lasting. 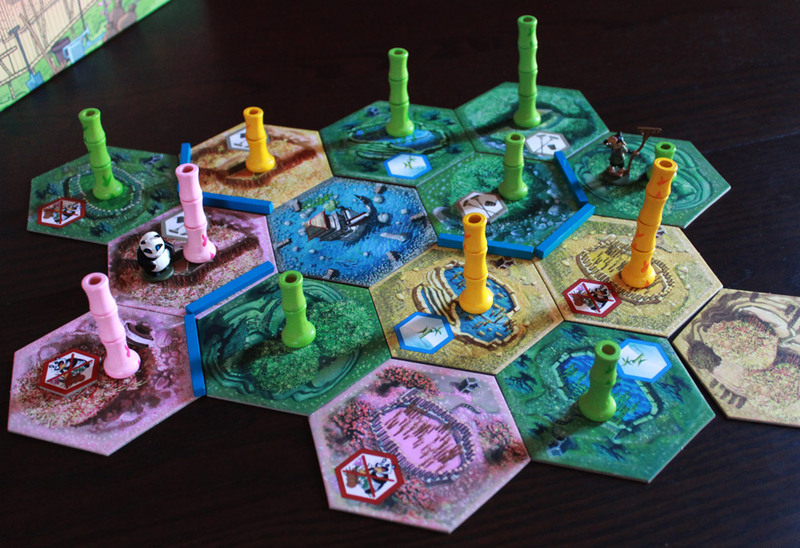 Only time will tell if Takenoko lasts longer than Tobago did). The mechanics are solid and allow for strategy, and the whole setup results in a lot of enjoyable tension as you race to the finishing point. Takenoko is one of the most beautiful games I’ve seen. The colors are vibrant, the artwork is fantastic, and the components are just about the toppest-notch you can expect. On top of that, the game’s not too bad either. Takenoko employs some strategy and tactics, but really, the main draw to the game is its beauty. The mechanics are fun and serviceable, but it’s the production layer over the rest of the game that makes this one stand out. It’s fun to imagine the laid-back panda eating bamboo, the high-strung gardener desperately trying to keep his garden growing. And the game doesn’t feel high stakes, which could be nice for those children or friends who take winning and losing too seriously. Takenoko feels like a leisurely game to play with friends, not a brain burner that reflects on one’s smarts outside the game. I mentioned that Takenoko has some strategy, but it also has a large deal of luck. The amount of points you can score in the game is determined by the cards you can draw. Each card you play puts you closer to the end game, so if you play all lower point cards, you’re not aiming for success. Now, you can hold cards back in your hand, but you can’t do this indefinitely: with a five-card hand limit, you have to play cards. This could be seen as a major con for heavyweight gaming groups. 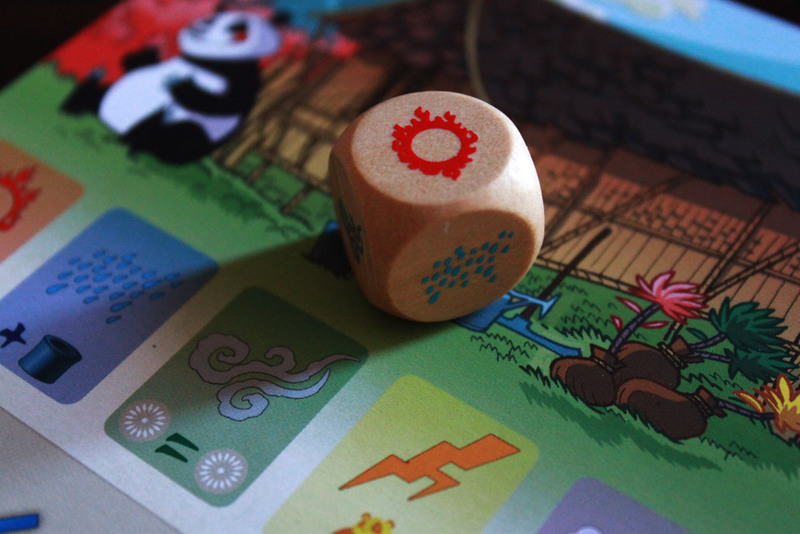 Whereas I typically prefer a game that allows me better chances to improve my position, Takenoko’s skew toward luck doesn’t bother me too much. The game is fun, and it does offer good choices, even if many of a player’s outcomes are not within the player’s control. I think @Futurewolfie gets it right when he says that Takenoko is a step up from Ticket to Ride in terms of complexity, but I don’t think there’s more player interaction here than in Ticket to Ride—at least, if Ticket to Ride is played with more seasoned players. I still think Ticket to Ride is the ideal gateway game, but Takenoko should be easy for families and casual or non-gamers to pick up. It’s got enough depth that a casual gaming group, a mixed gaming group, or a gaming group that just wants a break from heavy strategy games can approach and enjoy it. And like I said: I doubt you’ll find a more beautiful game. Great review! However , I think I like the game a bit more than you. I find myself smiling each time we play and while strategy maybe not be super deep, it is there, i.e , doyou irrigate , go for patterns, bamboo. Somehow it just strikes a perfect balance for me. One of my favorites! !